No one enjoys being micromanaged. It’s frustrating, demoralizing, and demotivating, yet some leaders just can’t help themselves. Working with a controlling boss is tough, but what if you’re the one doing the micromanaging? “You’re never quite satisfied with deliverables. You often feel frustrated because you would’ve gone about the task differently. You laser in on the details and take great pride and /or pain in making corrections. You constantly want to know where all your team members are and what they’re working on. You ask for frequent updates on where things stand. 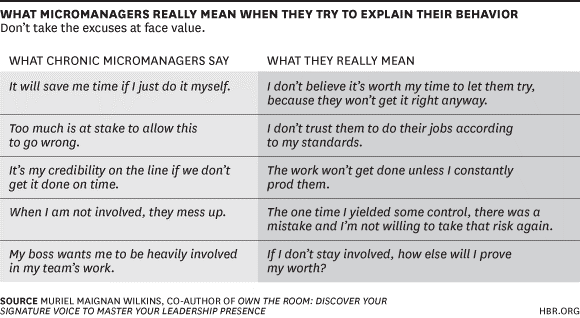 These excuses will only cause your employees to feel dis-empowered and demoralized. Instead of making excuses of why you need to micromanage, find reasons why you shouldn’t. 2. Let it go. Let go of the small, trivial details. Giving up control can be hard, but it’s much more manageable if it’s done a little at a time. Look at your to-do list and determine what low hanging fruit can be passed on to a team member. Talk to your team members about the level of detail you will be involved in and at what point they will need to pull you in. Also, highlight the most important parts of your to-do list, the tasks where you truly add value, and make sure you are spending most of your energy there. 3. Give the “what,” not the “how.” There is absolutely nothing wrong with having expectations about a deliverable, but there is a difference in sharing that expectation and dictating how to get to the result. Articulate what the final outcome should like, but don’t stick around and give step-by-step instructions on how to get there. If you’re doubting the progress on a deliverable, share the “what” and ask your team the plan to get there. It might surprise you how different approaches can often yield excellent results. 4. Expect to win (most of the time). The reason people micromanage is because they are afraid of failure, but by magnifying this fear your employees will start to believe the only way they can perform up to par is if you micromanage them. HBR calls this “learned helplessness,” and it’s a vicious cycle. Instead of voicing the risk for failure, set your team up for success: be clear on what success looks like, provide resources, information, and support when needed to meet those conditions, and give credit where credit is due. Eventually you will see that a loss every once in a while helps build a strong team with a great track record.